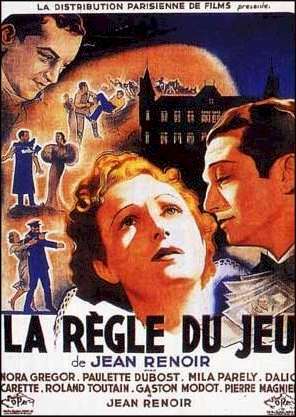 Entire books have been devoted to analyzing Jean Renoir's 1939 masterpiece, so it's impossible to do justice to this French classic in a single film review. 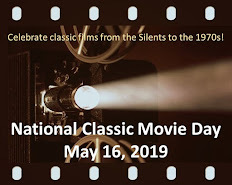 However, I am constantly surprised by the number of film buffs who haven't seen it, so I feel compelled to promote it as part of the Cafe's Foreign Film Festival--well that, plus it's been a personal favorite since I watched it in college long ago. Best described as a "comic tragedy," The Rules of the Game focuses on three themes: the relationship between and among the frivilous upper-class and their servants; the complex emotions between men and women; and the boundaries and expectations of society (the "rules of the game"). The film opens with the arrival of Andre Jurieux, a courageous aviator who has just completed a 23-hour solo flight across the Atlantic. As the public stands ready to hear about his heroic exploits, Andre uses the opportunity to whine that he did it all for a woman who didn't bother to be there and greet him. It doesn't matter to Andre that Christine, the woman in question, is married. Octave explains the "rules" to Andre. Andre's best friend, Octave (Renoir), has a long-standing friendship with Christine (Nora Gregor). He uses his influence to secure Andre an invitation to La Coliniere, a country estate owned by Christine and her husband Robert (Marcel Dalio). Robert is hesitant to agree at first, but Octave convinces him by agreeing to find a husband for Robert's mistress Geneviève (Mila Parely). At the country gathering of friends, relationships change amidst an avalanche of mixed messages and misunderstandings. A confused Christine contemplates an affair with a stranger, then confesses her love for Andre before realizing that her friendship with Octave may be much more. Meanwhile, her maid Lisette ignores her husband, the gamekeeper, and flirts with both Octave and a poacher-turned-servant named Marceau. It's a classical French farce on the surface, but it's undercut by a condemnation of the bourgeois and concludes with an unexpected tragedy. Geneviève participates in the hunt. Clearly, Renoir wants to expose the emptiness and thoughtless cruelty of the upper classes, the latter conveyed in the film's most famous scene: a hunting party that slaughters dozens of rabbits and pheasants. As if this sequence (which is difficult to watch) needed more conviction, Renoir forsakes his typical long takes for cramming in 51 shots in less than four minutes. The violence is shocking and the analogy--that the bourgeois are indifferently destroying an unsuspecting society--is all the more potent. It's no coincidence that the only likable members of Renoir's bourgeois are "outsiders." Several of Robert and Christine's "friends" feel sorry for Christine because she's Austrian. Later, we learn that Robert's father was a "Rosenthal from Frankfort"--meaning that he was Jewish. This allows us to feel empathy for them while still accepting that their vacuous life of luxury is no different from their guests. In Renoir's world, both upper-class and servant classes understand the conventions of society, even though they break them. Octave stresses to Andre that "society has rules." And one of the house maids, upon learning Christine allowed Andre to sit next to her at dinner, expresses concern because "etiquette is etiquette." It's ironic that the two most pathetic characters--Andre and Geneviève--are the ones who follow the rules at the risk of their own unhappiness. Andre may come across as a lovestruck fool, but he truly loves Christine and knows what he wants. Likewise, Geneviève understands that she doesn't want to lose Robert, although she confesses that "I don't know if it's love or force of habit." In contrast, Christine, Octave, and Robert struggle with trying to figure out what they really want. In the end, their actions seem foolish and perhaps even tragic, but as Octave explains to Robert at one point: "Everyone has their reasons." The history of The Rules of the Game is almost as fascinating as the film itself. Two of Renoir's previous two films--La bête humaine and Grand Illusion--were big commercial and critical successes (Illusion even earned an Oscar nomintaion as Best Film...not Best Foreign-Language Film). So, it was a tremendous disappointment when Rules of the Games flopped miserably. Renoir even re-edited the film, trimming its running time from 96 minutes to 81. During World War II, the Nazis destroyed all known negatives. Then, in 1959, a restored 109-minute version of the film was released. Renoir approved this version, although it's important to note that he was not involved in the restoration. Based on shooting scripts, film historians have compared the 81-minute and 109-minute versions. They contend that the shorter film was a harsher indictment of the upper classes, since it reduced or eliminated scenes that fleshed out the characters of Octave and Robert. Since 1952, Sight and Sound magazine has done a poll of the 100 Greatest Films every decade. The Rules of the Game entered the 1952 poll as #10 and has been #2 or #3 in every decade since then. The only film to rank above it: Citizen Kane. Great post about a tremendous film, Rick. I really like the ending: especially when Christine scolds Jackie for being so upset by Andre's death: "People are watching!" There are so many layers to this film...you need a mental scorecard to resgister who is doing what with whom. Both Bergman's Smiles of a Summer Night and Bunuel's Discreet Charm of the Bourgeoisie owe a huge debt to this film. Again, great review! I commented to Kim on her foreign film article that this is one movie category of which I am woefully ignorant. I have seen very few, eg. The Seven Samurai and Crouching Tiger. Eve wrote about one in which I am interested, and now you have too. I love the British movies about the upper and lower crusts, and I bet I would like this one. Great article, Rick, and I look forward to more articles that will steer me toward some of the best. Solid write-up, Rick. I've only seen a couple of Renoir's movies, and my short list unfortunately doesn't include this one. I'm very impressed that one of his films, a foreign language film, was nominated for Best Picture in lieu of the singular category created for movies outside of the U.S. This movie, as well as other Renoir films (including his Best Picture nominee), are available on Netflix Instant Watch. This is a fascinating film and your write-up was excellent, Rick. Everyone does have their reasons even if they are not sound or righteous. Ah, ce n'est pas de bourgeois!